September 30th, just a couple of days away from Hurricane Joaquin potentially impacting the U.S. coastline, and nearly all U.S.-based models had the hurricane directly striking the U.S. coast. The outlier? The (well-funded) European model that ended up correctly predicting the path far out to sea. A repeat of Hurricane Sandy, which U.S. models also struggled with, but the European model nailed. It’s more than a bit depressing at times lately, being a U.S. government scientist. Funding is a big part of that, as funding profiles for science in the U.S. government have definitely been on the downswing. For my own project, I’ve had to cut quite a few very good people over the last few years, as the funding I receive to do land-use and land-cover modeling (future and past) has declined precipitously. There are few things more maddening than working on a project, producing something the world has never seen, something that has tremendous value in helping science and society in general cope and plan for coming climate and land-use changes…and seeing your “reward” come in the form of massive budget cuts, forcing the release of great scientists (and friends). While the budget declines have been disappointing, what’s even worse is the public attitude towards science in general. Science and scientists used to be revered in this country. They were representative of progress, of leadership, of the United States’ leading global role. During the Cold War, scientific progress itself was as busy an arena for West vs. East competition as was geopolitical competition, with the space race captivating the world. However, in the past decade or so, science has seemingly become the enemy for many. As the conservative movement politicized what are inherently science issues, not political issues, the public’s opinion of science, and scientists themselves, has taken a hit. Instead of admiration, there’s a broad sector of the public that now views scientists with skepticism and mistrust. The politicization of climate change has certainly played a big role, as political talking heads push a pro-business, anti-environment message by attacking not only the science of climate change, but the integrity of the scientists themselves. Suddenly scientists are being portrayed as liars and swindlers, pushing climate change research only to support some mysterious hidden liberal agenda (SO hidden that even as as a bleeding heart liberal I can’t see it), or to ensure the big research dollars keep flowing (I myself would LOVE to know where conservatives think all these “big liberal research dollars” are coming from….I could use them!!!). In the meantime, science is suffering in the U.S. Environmental protection? Research for clean energy sources? Spending on environmental monitoring and assessment? All irrelevant, as they potentially impact short-term profit margins. It’s not just “fringe” science that’s being impacted, it’s core research and scientific monitoring that’s crucial to keeping Americans safe. If you followed Hurricane Joaquin last week, there was tremendous uncertainty in the path of the hurricane as it lingered in the Bahamas. Scientists use “ensemble modeling” to better characterize uncertainty in difficult to predict events, with a wide variety of models used to assess the same phenomena. Such an approach helps to form a “consensus” of multiple models. For Hurricane Joaquin, ensemble modeling was used to help identify a variety of potential tracks. In theory, the most likely path is something that the majority of models agree upon. Last week, the models were all over the map. Even by mid-week last week, the vast majority of U.S. based models were predicting Joaquin would track northward from the Bahamas, making a direct strike on the U.S. mainland, somewhere between the Carolinas and the New York area. Mid week, there was one model, the primary European model, that was an outlier. 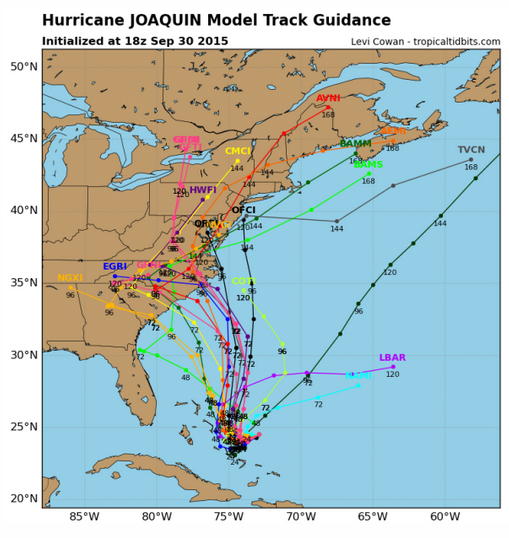 The European model predicted a Joaquin would jog to the northeast, missing the U.S. coast completely. The European model, although the outlier in mid-week predictions, was the closest to the actual hurricane path. U.S. models performed quite poorly in comparison. For Hurricane Sandy, there was similar uncertainty. For Sandy, the European model (correctly) predicted the hook into the New York area, while most U.S. models predicted Sandy would curve northeastward and miss the U.S. coastline. Again…it was the European model that was correct, with U.S. models performing poorly. There’s a great story on the New York times on how far behind NOAA and the U.S. Weather Service have fallen in terms of hurricane forecasting. Raw computing power is an order of magnitude lower for U.S. models than for the systems being used in Europe. Input data is lacking, as are other aspects of model parameterization. In short, the U.S. simply has not invested as much in basic weather forecasting and research as has Europe. As Sandy showed, and now as Joaquin has showed….the lack of adequate research funding for science in the United States has a VERY real impact on the everyday lives of Americans. Clearly it’s not just weather research that’s an issue. Science funding profiles are declining for nearly all fields. Keeping Americans safe from weather events, natural disasters such as earthquakes and volcanoes, research on treating or curing disease, protection of our air, water, and food resources…all are suffering from lack of investment. It’s a very curious disconnect right now, with technology-loving Americans seemingly often at war with science in general. As Joaquin and Sandy showed, and as countless other examples have shown…there’s a real price to be paid for an inadequate investment in science.